You are here: Home / Blog / Diet & Nutrition / New Year’s Resolutions – Should I Be On A Diet? 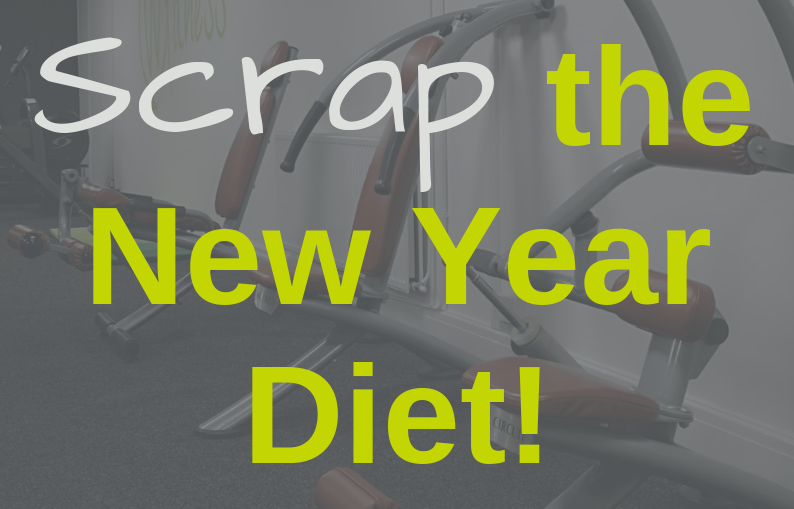 New Year’s Resolutions – Should I Be On A Diet? So, you begin your ‘New Year Diet’ full of enthusiasm, filling your fridge with the latest ‘healthy foods’ and starting the latest quick fix to losing weight; ‘the detox diet’, ‘the meal replacement shakes’, ‘the cabbage soup diet’, ‘the no-carb diet’ and the list goes on. You soon get fed up of feeling hungry and trying to maintain this unsustainable ‘diet’! Then, when you become hungry, you eat that leftover piece of cake, that bar of chocolate hiding in the cupboard or that bag of crisps (sometimes all three!) which you can’t seem to eat fast enough because they taste so good. So, let’s look at this another way. Should you even be going ‘on a diet’? The problem with this is that ‘going on a diet’ is perceived as something that is temporary, until a desired result is achieved, and then can be given up. The problem with this is that as soon as you stop ‘dieting’, you put the weight back on (and probably more). Therefore, the answer to this is to have a healthy, nutritious lifestyle that is easily maintainable and becomes such a normal part of your life that you don’t need to think about it. It involves a little bit of time and effort to start with, learning which foods contain sugar and how you can substitute healthy alternatives for high sugar products, but this will soon become second nature. We all need to eat and fuel our bodies, so it makes sense to do this in the healthiest way. You wouldn’t put diesel into your petrol tank, would you? Don’t try to destroy something that has to last you a lifetime. Look after your body. You have nowhere else to live! Similarly, with exercise, you join a gym or exercise regime full of motivation and with plans of losing 1 or 2 stone in 3 or 4 weeks! By the middle of January, you have lost your motivation as you aren’t getting the results as quickly as you want and your visits to the gym start to tail off until you stop going completely. Your New Year’s Resolution should, therefore, be ‘I’m going to eat healthily and maintain a healthy lifestyle’ This will soon become a normal way of life and you won’t even have to think about it. It’s a bit like going to university, you must work hard to get the degree in the same way that you must exercise and eat healthily if you want to be fit and healthy and to lower your risk of cardiac disease, diabetes and stroke. There are (unfortunately) no short cuts! Eat slowly and only eat until you are full. Chew your food properly and put down your knife and fork between each mouthful. Give yourself chance to know if you are full. Don’t wait until you are hungry before eating. This is too late, and you are more likely to eat quick, convenience food and eat it quickly! Fuel your body regularly with healthy, nutritious food – it’s much easier to eat slowly and eat the right foods if you eat before you’re starving. Eat off a smaller plate – You won’t notice you’re eating less as, psychologically, you have a full plate of food and you will feel fuller because the portion looks big. Choose lots of vegetables and fruit – at least half your plate and split the other half between lean protein (fish, meat, eggs soya and tofu) and high fibre carbohydrates (whole-wheat rice and pasta, wholegrains and pulses). Snack on foods that contain good fats such as nuts, seeds and avocados or choose Greek yogurt, fruit, homemade granola or healthy treats from our low sugar booklet such as chocolate brownies, digestive biscuits or vegetable crisps. Use old cookery books as they had smaller serving sizes. The average recipe is now 115 calories more a serving. Try to leave 3 bites of the highest calorie food on your plate. This will equate to losing 1 ½ stone in a year. If you have one high calorie meal, make sure that the other two in the day are low calorie. The calories will even out over the course of the day. Try to keep your meals to three different tasting foods. Your brain will start to tire of eating the same food and you will feel fuller more quickly. When you introduce a new taste, your brain overrides this and re-sets your taste buds making it easier to overeat. Enjoy an occasional treat – just not every day! Better still, make W Fitness your New Year’s Resolution. We offer a 30-minute full body workout in our exclusive members only female friendly boutique fitness studio offering unlimited support and motivation with our personalised diet and fitness programme. 30 minutes is easy to fit around busy work hours, it’s great for de-stressing and having some ‘me-time’ and it’s beneficial mentally as well as physically! We give nutritional advice and we are always on hand to help with motivation. We also offer Zumba, Yoga and Legs, Bums & Tums classes where, as well as getting an amazing work-out, we have a laugh and a giggle too! Add to this our friendly social environment where you can have a coffee, herbal tea or flavoured water and a chat! How Much Sugar Is In Your Christmas Speciality Coffee?